Money and time both go hand in hand. You may spend a lot of money on buying a laptop or PC but above all, it’s a depreciating asset and requires proper maintenance time to time. Imagine a scenario where you end up having issues like a failure of parts or malware and viruses attacking your device. When you check the warranty period and come to know it has expired, you get panicked. 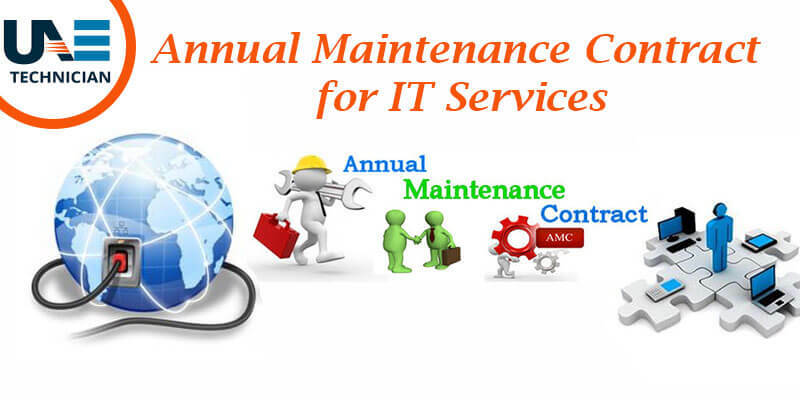 Here we can save you from the hassle and provide you a perfect solution called AMC for IT Services (annual maintenance contract). We, at UAE technician, offer you with a variety of options that will ensure smooth and uninterrupted operation. We believe in customer satisfaction which has made us come up with service-oriented solution covering diverse areas. Our team comprises of well trained and seasoned experts who make sure they handle your queries at best with diligence. We provide the facility for running troubleshoot problem onsite and offsite and systematic checks are regularly performed to rule out any room of mistake. We value customer feedback and give due consideration to implementing it without delay. We have served in entire UAE and supported areas of Dubai. With an experience of serving many clients with diverse needs, we can assure you excellent service and support. To be successful in today’s world, one has to maintain the quality and make sure it improves consistently. You may have a lot of things to care about, but for us, it will be of paramount importance to back up the performance of your operations. UAE Technician ensures that you get 99% uptime guarantee, an expert team of IT professionals who has ample amount of experience and Pro-Active IT Support which is cost-effective too. What are the Benefits of Annual Maintenance Contract for IT Support? Instead of addressing maintenance issues, you can focus on your work uninterrupted. It offers you information protection. Strike the Winning Edge: Contact us! If quality and affordability are high on your priority list, then we can be the answer to all your worries regarding maintenance. Our client satisfaction level speaks for itself which makes us a leading IT Solution annual maintenance contract provider in Dubai. The solution to all your queries is waiting for you just a call @ 042053349 away. Contact our experts and get going!